Anything that starts off with calling their readers stupid is going to grab my attention, and I am reviewing a free PDF of Kitty and Batz Number 1 from LHV Publishing. 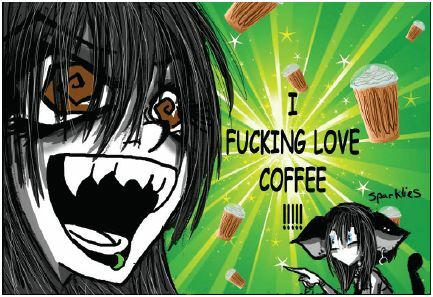 As soon as I stop laughing I’ll tell you why I liked this comic, and as soon as you realize I have been to far too many Anime shows in the last five years you will understand why I am laughing so hard at the comic. Meet Kitty and Batz, probably two of the most irreverent Goth teens you would ever want to meet. Meet also Doodles by Mad, places throughout the comic where stick figures rule the world. Is there swearing? Yes, is there blood, Yes, is there all sorts of things your kids will find funny unless you lost your sense of humor when you got older, yes. Will you let your 12 year old read this? Probably not, unless you are an ultra cool parent along the way. Yes the comic is not for kids, there is a mature audiences label on it, but mostly for the swearing and general contempt for the modern world they live in and the Ipod they listen to on the bus. 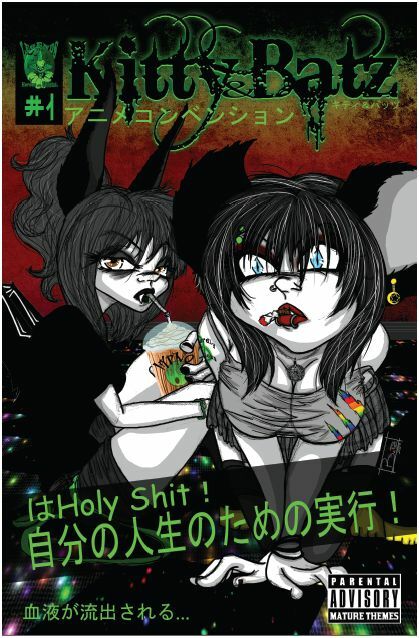 The humor part is that our two Goth irreverent teens find themselves at an Anime convention, and knowing that we just finished up with Akicon (where you do not tell a cross dressing guy he needs a shave), and we are planning on other anime conventions next year will have you falling over. Yes, true otaku take their anime very seriously, oh yes, very very seriously. And if you are not part of the taking things far too seriously scene like Kitty and Batz, well then you are in for an eye opening experience. A world when Cyber Goths, Emo Kids, and Cosplayers mesh wonderfully from page 13 on all the way through the Anime convention. You will see it all, from the people walking around with free hug signs (come one you can’t say you didn’t want to hit them like Kitty and Batz do), or cosplayers that are so deep into otaku they can’t breathe normally, to everyone else in between. The only thing they do not have is anyone in Doctor Who Cosplay. That and a strange addiction to coffee. Is this a slick production with awesomely drawn art, no, it really is more like Johnny the Homicidal Maniac or the Bad Art Collection. There are deep overtones of Johan Vasquez throughout this comic book that makes it simply fun to read. It is in color, and they found some really lurid colors that must have been hard to print up in real life. Overall, this was an entertaining comic book to read, and well worth adding to your collection. With a look and feel of JTHM (Johnny the Homicidal Maniac), and a punchier story line, you might actually like this independent effort. Now if I can just get them to send come real world copies my way so I can share them. Rating this one 5 of 5, cause it rocks, easy to read, well colored, and just a lot of fun to read.